Vaughan Rapatahana: Can you please tell us your tribal affiliation(s)? Briar Wood: Ngā Puhi Nui Tonu. Like many of the whānau I’ve spent a lot of time away from the north, and that just makes me think about it more. The harbour’s still as a milk vat. in the trim rebuilt mission house. a binding signing of Treaty papers. skims into a vast blue morning. the sovereignty you did not sign away. 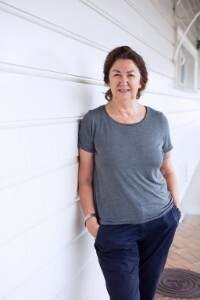 BW: My early years at school were spent in Māngere in Tāmaki Makaurau, studied at the University of Auckland, went to study women’s writing at the University of Sussex. Spent the next thirty years travelling between Europe and the Pacific, teaching writing and literature in London a lot of the time. It is interesting work and I love the multiculturalism of London. I’ve been publishing since the 1980s – usually a few poems here and there yearly, stories, reviews, essays. Most often I’m inspired by wāhi – locations, the ecology of places, the way it all fits together – whenua, tangata, moana. Welcome Beltane, a collection of poems, came out in Britain in 2012, and the positive reactions to the poems encouraged me to put another collection together. Working with Kiri Piahana Wong at Anahera Press on the next collection Rāwāhi (2017) was a real pleasure. and has much to say about piety. The man’s a sedentary cliché. also protests. Of te tiriti. starts each day at eight sharp. his sermon from the text James iv.1. From whence come wars, etc? at Pakaraka for his eleven offspring. fruit, mutton, coffee. A good spread. Women in the kitchen prepare luncheon. VR: I know that you do endeavour to write ki te reo Māori. How important is it for you to write in te reo, please? BW: Having a relationship to te reo is always part of what I do. I learned some te reo when I was young, for which I’m always grateful. Being in London for so long meant there was not much chance to kōrero in te reo, and it’s a significant part of te hokinga mai – returning, that I’m able to listen to te reo being spoken often. The collection was called Rāwāhi because having the opportunity to be immersed is so moving. Languages are the work of a lifetime. I’m aware of how much I don’t know. Back to classes for me! VR: Relatedly, how important/vital do you think it is for Kiwi writers to write in te reo Māori, please? Or at least attempt to? BW: Te reo Māori is the language of continuity here in Aotearoa. Te reo writers are indeed vital and the writings are taonga. Ka nui ngā toikupu, ngā pūrākau, ngā tuhinga, ngā pakimaero, ngā pakiwaitara me ngā waiata i te reo Māori. Kei te hiahia pānui ahau ngā tuhituhi anō i te reo Māori. Me kōrero atu ngā kaituhituhi. Me kōrero ngā kaituhituhi ki ngā tupuna me ngā tamariki. Kei ngā tuhituhi nā nāia nei ngā tāhuhu kōrero āpōpō. of the way ua stirs up silence? kōuaua – scattered light rain. Should I wear a pūreke today? to swim, too rough for anyone. Kāore he tohu kino ake te ua. to bloody well stop raining. VR: Finally, do you think you might have a go at writing some flash fiction…? BW: That feels like a little nudge and in the right direction – thank you Vaughan. I have a couple of flash fiction stories – it might be a realistic aim to write one in te reo. Or two. Being in the company of Māori writers – it makes so much possible. Aroha. The Minister’s booking is a coup for the company. She is constantly in the news, with a two-year old and a new born baby, Eden. The entourage will pause in the cafe room for photo ops and coffee, before moving to the conference suite. Two security men are stationed at the door. Cait, Parī’s business partner, flashes an item about a drone at the airport on her phone at her. Joanne, the Minister, reads her notes and checks the agenda. There’s a knock at the door, and a subtle man in a suit asks Parī to pass on a note. She catches some key words from under the table. DRONE, EMERGENCY, AIRPORT. The Minister folds the note, puts it on top of the table, adds a point to the agenda. Then she leaves for the conference room. Tessa, the carer holding the baby, follows after. Later, right at the planned hour, the door from the conference room opens again as Tessa emerges with a sobbing Eden. ‘Have you heard any more?’ Joanne sits down heavily on one of the bentwood chairs, shaking her head as Tessa hands Eden to her. Picking up the notepad at her place on the table, Parī drops it to her knee, draws an image of te kara. When she looks up again Cait too is writing covertly, as is the Minister. Parī hands her note under the table to Cait, opening the return message from her partner to a sketch of the flag of tino rangatiratanga. Briar Wood grew up in South Auckland, Aotearoa New Zealand. Until 2012, she lived and worked as a lecturer in Britain. Welcome Beltane (Palores Press, 2012) made poetic links between family histories and contemporary places. Her 2017 collection Rāwāhi (Anahera Press) is focused through a return to Northland places where her Te Hikutū ki Hokianga, Ngāpuhi Nui whakapapa resonates with ecological concerns.